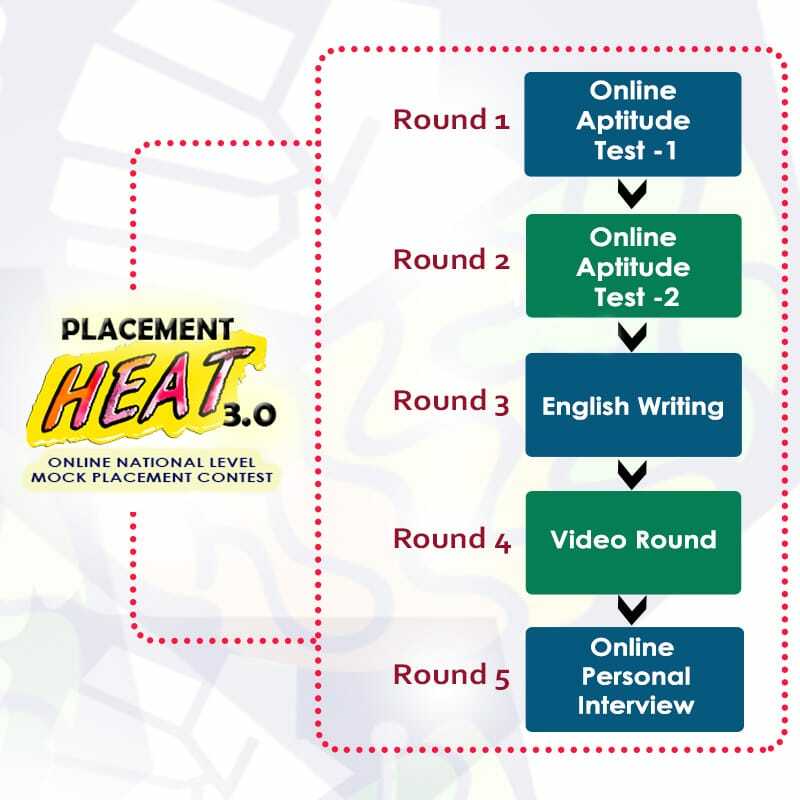 "Placement Heat 3.0" is the third edition of purely online Mock Placement contest testing undergraduate students on a national platform. All First Year to Final Year ( engineering / management/ commerce / pharmacy ) students from all streams and branches are eligible to participate in this event. It will be a 5 stage contest in which Aptitude skills, English writing, speaking skills, and Interview skills will be tested. Attractive cash prizes, Free Mock Test pack, Free registration are the major features of this contest. Participants need not travel to any place to participate in the event is the main USP of our platform. Participation certificate and Free Test Pack will be given to all participants. Winners and their colleges will be given a national level recognition for their achievement. All the participants will get a Free Test Pack of 25 Practice Aptitude Tests with detailed Test reports and Analytics after each test. All participants will also be given a participation certificate. Talent Spring Award: Top 3 Colleges with a maximum number of students in the Top 100 ranking list will be given this recognition. Enthusiastic Talent Award: Top 5 colleges with the most number of participants will be given this recognition. 1) All First Year to Final Year ( Engineering / Management / Commerce / Pharmacy ) undergraduate students from all streams and branches are eligible to participate in this event. 2) The competition consists of 5 stages/rounds. All the rounds can be attended by participants from anyplace. 3) Students need to arrange their own laptops/desktops facility to attend the various rounds of the event. 4) Participants will be communicated with the exact date and time of the rounds after registration. Participants have to strictly follow the round timings as per the time communicated to them, failing to do so will lead to disqualification from the event. 5) Participants will be asked to produce their college ID cards during any stage. Any discrepancy or malpractices found will disqualify the candidate. 6) All tests conducted during the event are secured to avoid malpractices. Students found cheating or trying to cheat in the test will be disqualified directly. 7) Those students who were part of 25 students in the first and second edition (both contests) of Placement Heat contest, are not eligible to participate in the third edition. Those students who were in Top 25 for only one edition can participate in this contest. 7) Talentbattle.in will not be responsible for the monetary loss of entry fees of disqualified participants. Any first year to final year (engineering/management/pharmacy/commerce) undergraduate student who is having a valid student ID card of their college or university is eligible to participate in this competition. Do I need to go to some center and participate in the competition? Our mock placement competition is purely online. You can attend the competition from anywhere. 9th March 2019 will be the last date for registration. How will I come to know whether my registration is completed? Students will receive an email / sms about their successful registration. Is there any registration fee for Placement Heat 3.0? 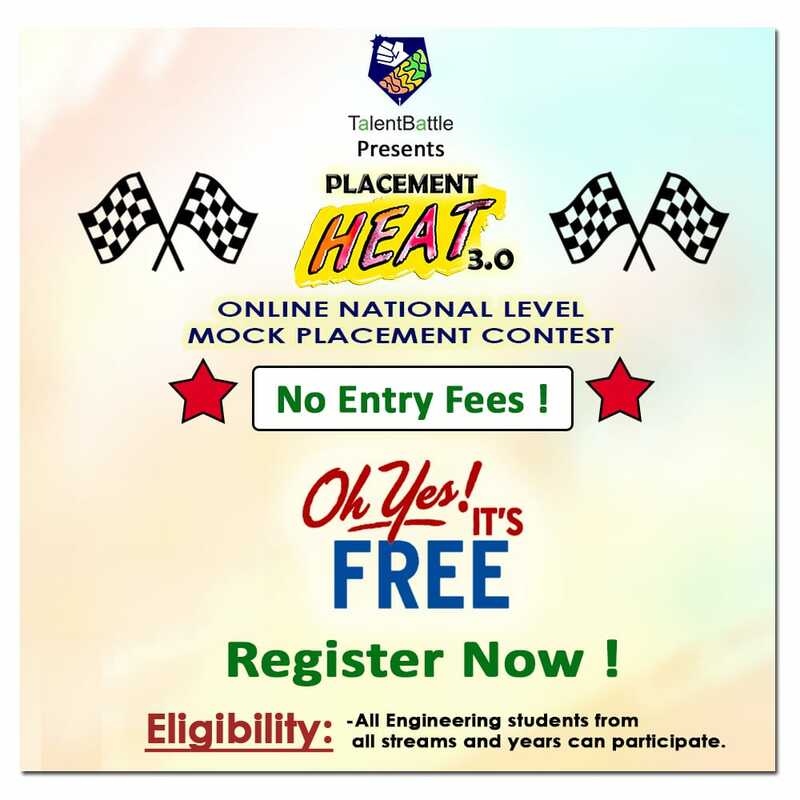 Placement Heat 3.0 is completely free for all participants. I am not able to register, what should I do? You can send an email to contact@talentbattle.in . Details of Online aptitude test round 1? The test will be based on general aptitude questions on quantitative, logical and verbal reasoning. Duration and instructions about the test will be conveyed on 5th March 2019. Details of Online aptitude test round 2? Selected students will be eligible for the second round. This time difficulty level of question will increase. The test will be based on general aptitude questions based on quantitative, logical and verbal reasoning. Details of English writing round? Selected students will be eligible for third round. This time difficulty level of question will increase. The test will be based on English writing skills. Details of Video testimonial round ? Selected students from the third round will be given the general topic. They need to record their video with their introduction and opinion about that topic and send it to us. Communication skills, presentation skills, thinking process will be analyzed during this round. Details of Online Personal interview by Professionals? Experienced HR professionals from the industry will take your personal interview through SKYPE. The question will be based on your personality and challenging questions in some situations. How can I access free test pack? Students will get the link for accessing test pack on their registered email id. An email will also include log in id and password for a particular account. What is the validity of test packs? Test packs can be accessed for the duration of 6 months. How will I get a participation certificate? Students will receive participation certificate on their account on talent battle portal. Students can download their participation certificate once the competition is completed. If my internet connection is down on competition day, what should I do? Good Internet connection is a must. You need to ensure you are having a properly working internet connection with good speed. Do not use mobile wifi hotspot as an internet connection. Test failure due to a weak internet connection can lead to disqualification. If during the test, my test stops in between (due to electricity or any other issue), what will happen to my test & what should I do? You need to contact the Talent battle team at such a situation. How I will come to know that my test has been submitted successfully? You will see "test submitted successfully" message on screen once you click on submit. Don't close the test before getting successfully completed message. When the result of the first round will be displayed? How will I come to know about the result? Selected students will get a mail regarding that on their registered email id. What is a college level winner? What are the conditions and prize for it? Talent battle will award top 3 winners from each college. Cash prizes will be given to college-level winners. Students from Colleges with minimum 500 participants only will be eligible for this Prize. Winners will be conveyed about their reward through email and also winners will be displayed on our website. What will be the exact time of the competition? The exact time slot of the competition will be conveyed by email to registered students on 5th March 2019. How & when winners will receive their cash prize? Winners will receive their cash prize in their bank account. Once the result is announced, within 10 days, after cross-checking of id proof details, the prize will be given and will be conveyed to winners. In case any winner is found cheating then the winning prize will not be provided to that particular student. How the result will be declared? Results will be published on website and participants will also get an email. How Talent battle ensures students don't do any cheating online? Since it is purely online competition, our main challenge is to avoid malpractices during competition. There are various proctoring and security features on our website which will be used during the various round to avoid malpractices. During the last interview round, all data will be cross-checked and if any student is found doing unethical practices, that student's registration will be canceled and details of that particular student will be provided to the college authorities. Copyright © 2019. All Rights Reserved By Talent Battle Pvt. Ltd.